For years I treated “leading” like a four-letter word. I described what I did only in safer terms like “helping,” “serving” or maybe “facilitating.” If I accidentally used the word I’d blush and quickly follow it with an apology (as if I’d cussed like a sailor) or a disclaimer (“I don’t mean I’m a real leader”). But slowly, gently, insistently God began revealing to me that leading is something everyone is called to. When Jesus said, “Go and make disciples” He was talking to all of us. And I’ve come to believe that’s what leading really means: it’s simply living in a way that helps others follow Jesus. But the reality is we serve a creative God and there are as many kinds of leaders as there are opportunities for leading. Yes, some people are corporate leaders who have the corner office. Some are comfortable on a stage with a microphone in their hands. Some are networkers who seem to make a thousand friends in five minutes. But some are thought leaders who influence through ideas birthed in silence and solitude. Some are relational leaders who move others simply because of the depth of their caring. Some are practical leaders who work in orderly, ordinary ways that may go unnoticed but actually make everything else possible. We don’t need to be like anyone else in order to lead; we only need to be like Jesus. He has a specific assignment for each of us. And we are designed to complete it. If this still sounds a bit scandalous ask yourself, “In the past week, when did I simply help someone take another step?” Maybe you offered just the words a friend needed to get through a hard day. Perhaps you guided your kiddo through a tough homework assignment. Your insight might have played an important role in a project being completed at work. I would challenge you that in all those moments you were a leader. Oops, did I say “leader”? What I really meant to say was…wait, that really is what I meant to say. The time has come for us to be brave enough to own that word. We may do so with our knees knocking in our cute shoes. We may feel like someone is going to find out we’re a fraud at any moment. We may wish we could hightail it back to our comfort zone. But we will stay. We will stand tall. We will dare to say it. Because we are women. Because we are daughters of the King. Because we are leaders. I originally shared the post above as an article for Propel. But as we wrap up our You’re Already Amazing LifeGrowth Guide Book Club it’s coming to mind again. Because I have a challenge for you: Now that you’ve gone through the material, will you facilitate a LifeGrowth Guide group either in person or online? Everything you need is in the back of the You’re Already Amazing LifeGrowth Guide. I provided resources so that even if you’ve never led anything — you can do this. That’s my dare and invitation for you. And I’ll be cheering you on all the way! 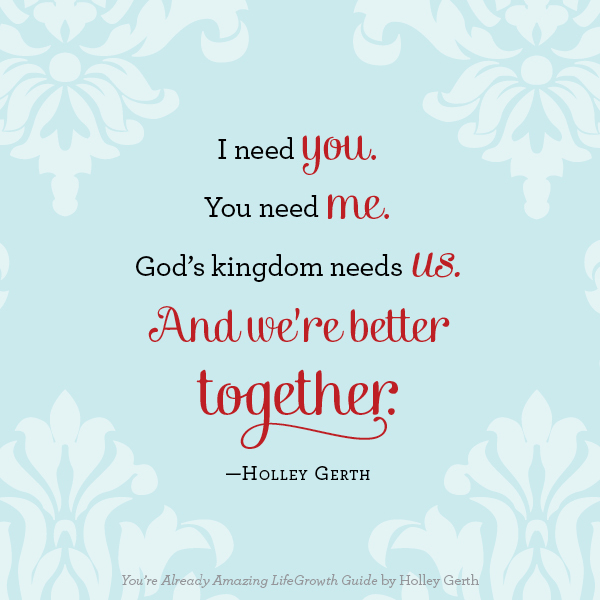 This post is part of the You’re Already Amazing LifeGrowth Guide Book Club. You can still get your copy of the LifeGrowth Guide and you can read all the book club posts here. If you’d like to be the first to hear about future book clubs, become an official member and get a free printable. I share on Twitter, Pinterest and Facebook. These are also my work accounts (at least Facebook and Twitter are), so it reaches people who not normally read this type of material. Holly, just read the first 34 pages of that book Yu wrote….re Amazing Women! Excellent…..I’m always amazed how academically the knowledge is there, yet the heart does not perceive or believe it…..my personal belief is our “heart mind/thinking” is based on our “experiences/nurturing/or lack of”.? ?…..amazingly as well, to think that my spiritual self also has two minds……I know the scriptures, and all the wonderful promises it holds….yet do I truly believe and integrate the knowledge…..? Yes, your work is excellent …thank Yu for sharing…..
P.S. I’m a Senior….with tons of life experience….and I still ask “who am I”? It’s a daily pursuit……with at times amazing findings…..Blessings to You! I am considering starting a life group with your group. I have been blessed by your words and have shared them on my runs with friends, who were in need of lifting up. Thank you for your words and encouragement. As I read this I was thinking about ” Follow the Leader “, children rally around that and I’ve seen an overly rowdy four year old suddenly spark seven and eight year olds into chaos. So we, as believers and followers of Christ’s example should never hesitate to lead. even if we don’t have all the answers we know who does. I’ve thought of leading an online group at my blog, but I have so many fears and insecurities. However, I do feel more secure in God’s LIFE statement for me and have learned that I am right where God wants me at this time. Thank you for everything, Holley. Blessings and hugs to you! I’m starting a group for single moms like myself from my church. I am leading my online bible study group through your book and lifegrowth guide starting tomorrow morning. We are sooooo excited! Some of the girls have already started reading the book and they LOVE it! How should I lead with the book and lifegrowth guide since you wrote it later? Should I get them to read a chapter a week of both? They go hand-in-hand together. You’ll see references to the book in the Guide! Thank you for your energizing words, Holley: “We don’t need to be like anyone else in order to lead; we only need to be like Jesus. He has a specific assignment for each of us. And we are designed to complete it.” Praise God for the way he creates each of us for unique purpose, and in fulfilling that purpose, we experience glorious soul-satisfaction! How wonderful is that?! This is right on point for me. I had a young lady approach me a week ago after church asking if I could help her with studying the word of God. She went to tell me that I had a beautiful spirit, and I admit I resisted the idea. But, the more I thought about I felt compelled to give it a shot. We haven’t had our first meeting yet. However, this is the least I can to do to help my sister. And, I’m honored that God is using me to “lead” someone closer to him. Oh my goodness Holley you really are amazing! Just the fact that you are able to put it out there so to speak and bring us to the table of Christ’s truth! Yes I do want to lead a group with this Amazing Lifegrowth guide! I’m so glad several of you are taking the challenge with me!